I was advised that there was two ways to wear this product, firstly applying it to a brush or fingers and blending it in immediately for a more light weight finish, and secondly to rub it into your fingers untill the product thickens up (you will instantly feel it thicken after a 60-120 seconds) and apply it with your fingers by dabbing it on and blending as you go. Although it is very lightweight, when applying it with the brush/fingers it didn't blend well, even with a good handful of moisturiser lathered underneath. I felt like I needed to apply a large amount of product at one time so that it would blend easier, but then that made it feel quite cakey once applied and looked a little patchy from where parts of the foundation had dried and others hadn't, so blending it was difficult. On a different occasion, I applied it by rubbing the product into my fingers, thickening it up and then applying it using the tips of my fingers. It felt totally different on my skin, it was quite thick (felt a little like the studio sculpt foundation texture) and required a little more blending then I'm used too. Once I had applied it all over, it felt sticky, tight and cakey. You can see in the above photo that the foundation is runny, giving the impression of a lightweight, dewy finish foundation, but like I said it wasn't all that lightweight to me. However, the finish is very dewy which is a quality that I really like and usually go for in foundations. The lid is very hygienic, easily cleaned, easily applied although it does make a bit of a mess as you can see! But what foundation doesn't.. In the bottom right photo above, I have swatched both ways of applying. At the top you can see how it looks a little less cakey and heavy and this is blended in immediately with my fingers, the bottom one has been warmed up in my finger tips and then applied. I think it is quite easy to tell the difference! What skin type is it best suited to? So from this you can probably tell I was not all that impressed, but I refused to give in! After spending that much money on the product I was determined to like it. Throughout August I have tried and tested this foundation quite a lot, and I am now beginning to get on with it a lot better! I think it is just one of those foundations that work totally differently on different skin types. 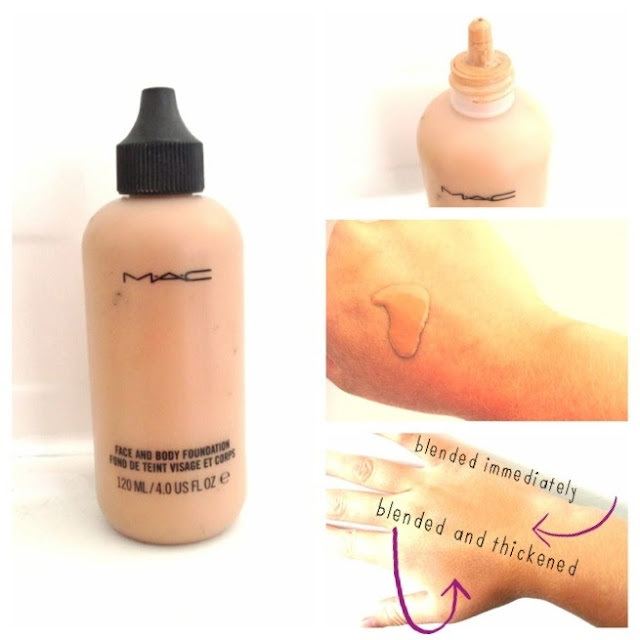 If you have combination to oily skin, I think that this product will be best suited to you as you already have a good amount of natural oils on your skin, which will help with the blending and application of the foundation, however us dried up proons will find it a little more difficult to work with. Although I personally wouldn't buy this foundation again, it is coming up to winter now and I will probably get a lot more use out of it. In the summer I tend to go for lightweight and dewy finish foundations, whereas in the winter I like to thicken it up a little. If you are a dry skin gal/guy and you want to try it, don't let this post put you off. It simply is a case of applying it in the way that suits your skin type. Im a little lazy and don'y like to spend ages prepping and priming and applying and blending, so for me its not a contender. If you are on the verge of buying this but are having doubts.. here's a positive that may help you sway! I was advised by the MAC lady that this foundation is used all the time on television, on models, in photoshoots etc etc. So if you want to look like a model than maybe this is your calling! Minus the negatives above there are a few postives to this foundation- there is a great range of colours, it does last a very long time, it's great for evening out skin tone, especially pigmentation on the skin and body. Being a face and body foundation, you can use this all over the body on areas that you want to even out! If you have any questions please do leave me a comment or ask me on twitter! send me a photo on instagram if you like of your makeup look including this product! Untill then, Ciao Ciao BB babes!